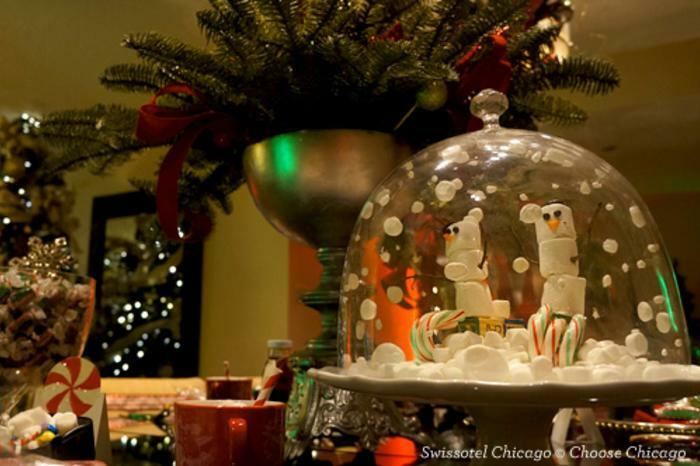 Chicago&apos;s hotels go all out for the holiday season, making for a magical winter getaway. From grand trees festooned with gilded ornaments to a gingerbread elevator, the attention to detail and creativity will send your holiday spirits soaring. 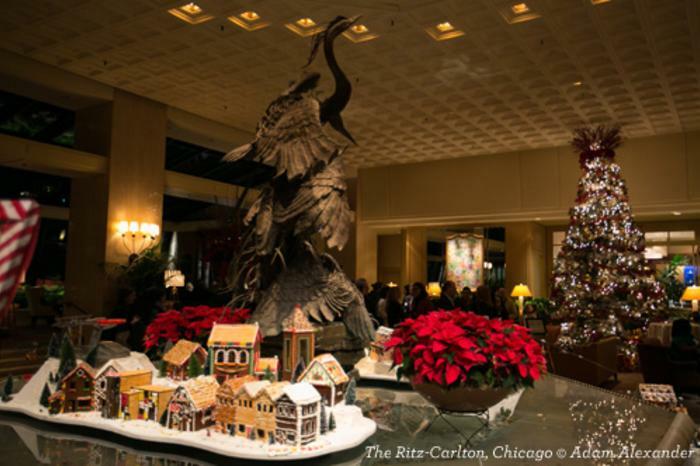 Here are 7 must-visit Chicago hotels that feature spectacular holiday decor. Throughout the season, guests at Trump Hotel Chicago will be transported to a holiday wonderland via the Gingerbread Express, a special elevator traveling up to the two Michelin-starred restaurant, Sixteen. The elevator itself is dressed to the nines in everyone&apos;s favorite holiday indulgences — gingerbread and candy canes. Created by Executive Pastry Chef Aya Fukai and team, guests who ride the Express will be greeted by the sweet aromas of the season, celebratory holiday music, and more than 1,100 gingerbread bricks made especially by the pastry team. The Gingerbread Express begins on Nov. 18, 2018. When the big man in red comes to Chicago, the Swissotel Chicago puts him up in style. Starting on Dec. 1, the hotel&apos;s five-room Presidential Suite is transformed into a stunningly whimsical display decorated in the spirit and magic of the season. Six Christmas trees, a table set for Santa and his reindeer, and snacks and giveaways to spread good cheer greet hotel guests and visitors: Stop by on December weekends through Dec. 23 for Santa Days, including a letter-writing station, face painting, complimentary hot chocolate, cookies, a cash bar for adults, and a visit from Santa. For over 140 years, Chicago&apos;s Palmer House Hilton, located in the heart of the Loop at the corner of State and Monroe, has been treating guests to opulent and gracious hospitality. Retail and real estate magnate Potter Palmer considered the Palmer House his crown jewel; hence he named the extravagant hotel after none other than himself. Once touted as the largest hotel in the world, the Palmer House Lobby has seen dignitaries, celebrities, and royalty come and go, since the hotel was established in 1871. 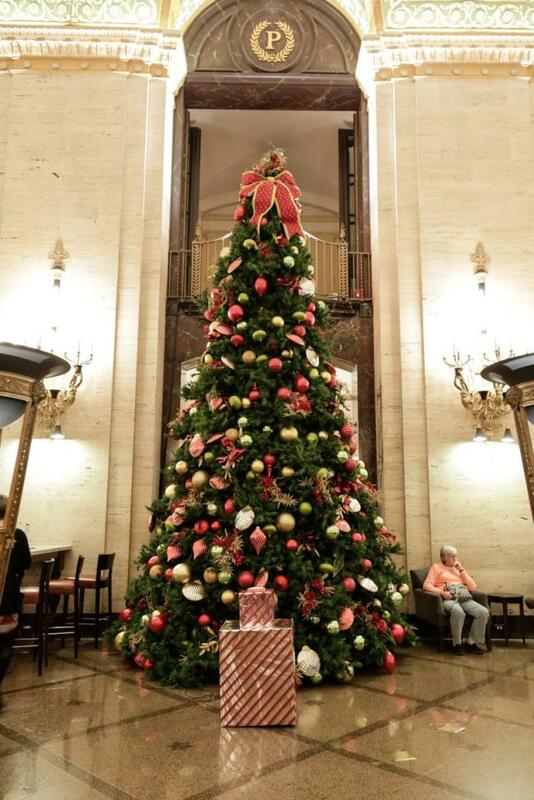 The Palmer House Hiton&apos;s 18-foot tall tree, decorated with 7,000 lights among its 15,000 branches, is located in the grand, historic lobby. Enjoy a holiday cocktail from the Lobby Bar: The Hot Toddy features warm Seedlings apple cider cooked with cloves and cinnamon and Calvados brandy; Hot Buttered Rum is made with Myers Dark Rum, homemade vanilla ice cream mixed with butter, cinnamon, nutmeg, cloves and brown sugar topped off with vanilla hand-whipped cream and sprinkled cinnamon. Mulled Red Wine is warmed with orange and lemon zest, nutmeg, star anise, cloves, vanilla bean, brown sugar and honey. Or keep it non-alcoholic and opt for the premium hot chocolate or spiced hot apple cider. 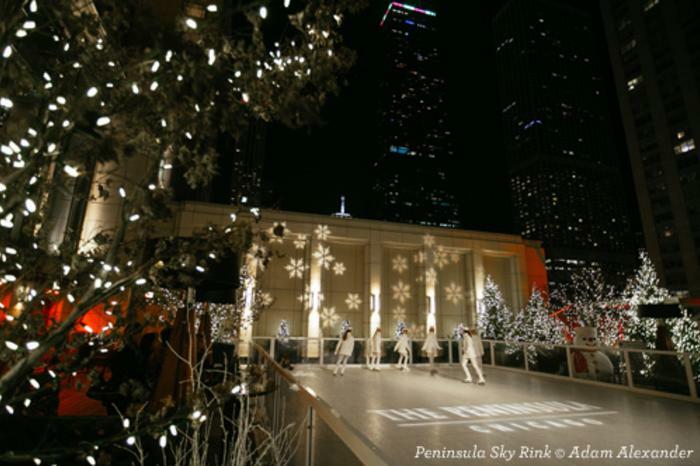 Surrounded by the twinkling lights of Chicago&apos;s skyscrapers, the luxe Peninsula Hotel&apos;s Sky Rink is perhaps the tallest skating rink in Chicago. Tucked into a pine tree filled winter wonderland, skating here is truly a one-of-a-kind experience. Step into the onsite Chalet for a selection of hot beverages and snacks including: hot chocolate, cider, glühwein (a German, warm spiced wine), warm pretzels, funnel cakes and apple fritters. Admission and skate rental is $20 for adults, $10 for children, with all proceeds benefiting children&apos;s charities. Enjoy tea blends, cocktails, finger sandwiches and pastries at Torali inside The Ritz-Carlton, Chicago. Tea is served at 3 p.m., Friday through Sunday until Dec. 23, 2018. At Allium Restaurant and Bar, a Chicago culinary favorite located within Four Seasons, guests are greeted with elegant holiday decor centered with a cozy fireplace and roasted chestnuts, served complimentary between 5 pm and 8 pm, Thursdays thru Sundays, until December 30. Your spirits are sure to be merrier and brighter as you enjoy the chestnuts paired with Allium&apos;s seasonal hot chocolates and cocktails such as the Ol&apos; Saint Nick and the Worn Reins. Christmas just isn&apos;t Christmas without a tree, and the Waldorf Astoria Chicago goes the extra mile to make sure guests feel at home over the holidays. From the minute you enter the classic cobblestone courtyard, you&apos;re sure to feel the holiday spirit with a 20. Ft. evergreen Christmas tree adorned with white lights and a front lobby embellished with green garlands and shiny baubles in silver, purple and magenta hues. Upon request, hotel staff will also decorate your suite with a fully ornamented 8ft tree. Order a delectable gourmet hot chocolate from room service — dark chocolate cardamom-meringue, milk chocolate with cranberry and clove or milk chocolate with fresh peppermint — and you&apos;re all set for a cozy Christmas night in Chicago.